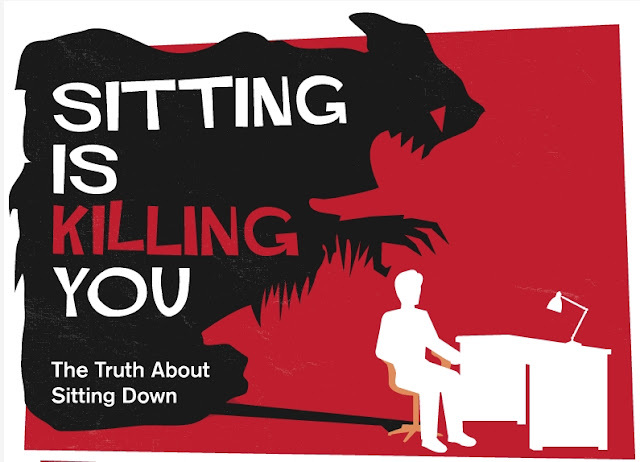 As those of you on the Facebooks know, sitting has recently been declared lethal. No, really! Naturally, it is now incumbent on all of us in the sedentary professions to devise a plan of action to reduce our sustained sitting! At least until the next wave of research reveals that the current findings, although valid, are overstated! ...and that given a choice of an office chair or a heroin habit, the office chair is maybe the better choice. Well, I'm here to help. Here are some of the strategies I've been experimenting with since the story broke. Results: Although quite to the point, this plan of action has proved a little elusive in field testing. 2. Work in a large open-plan office where the printer is about a quarter mile from your desk. Results: I have this one nailed! I am trying to "leverage" this "asset," as we say in the paperwork, by reducing my efficient use of the printer. For instance, instead of saving up multiple documents to print all at once, I am making sure to print each document individually. This multiplies opportunities to interrupt long, hazardous periods of sitting. Results: This can interrupt sitting once, if you go to the tap once to fill a water container to bring back to the desk. But why teach yourself to fish, if you can just give yourself a fish? Using the drinking fountain or water cooler dramatically increases interruptions of toxic sitting. Results: This strategy is highly synergistic with #3, above. Obviously the benefit is maximized for those who have mastered the art of peeing while standing up. 5. Stand up while using the phone. Results: Not only will this combat sitting, but you may find yourself bringing additional confidence and energy to your telephone conversations. I do. Really! Sometimes it makes me a little punchy, frankly. 6. Open up the workplace environment. When your boss or coworkers bring you a new assignment or criticism of your work, respond by suggesting "Let's take this outside!" or asking "Would you like to take it outside?" This will give both of you a chance to get some fresh air and to have a frank discussion in a non-traditional work environment, all while avoiding the Chair Peril. Make sure to make your suggestion with a lot of enthusiasm, so they know you're sincere! Results: I haven't tried this one, but I really want YOU to! 7. Walk around purposefully. If you feel like your sitting is reaching a dangerous duration, and you lack a good excuse to stand, here's what to do: put a significant-looking document on a clipboard and walk around your workplace looking at it with an abstracted, slightly worried expression. Results: This works like a charm, and as a side benefit will improve your reputation as a committed, serious employee. However, do not try this strategy if you are a sole proprietor or, especially, if you are a long-haul trucker. 8. DESTROY YOUR OFFICE CHAIR!!! Results: Though certain to prove effective, this strategy may be subject to the law of unintended consequences. Be sure to think it through carefully before taking action. 9. Come on and dance! Come on and dance! You may not get another chance! Results: No matter how grimly prescient the Steve Miller Band's ominous assertion has proven to be, you may still find that there remains some social and professional resistance to obliging the Terpsichorean muse in a contemporary office setting. 10. Convert to the "Standing Desk." Results: Not only will you avoid the perils of sitting, you'll be getting a jump on the new "Lower Back Pain Epidemic." READERS! Join me in the fight! 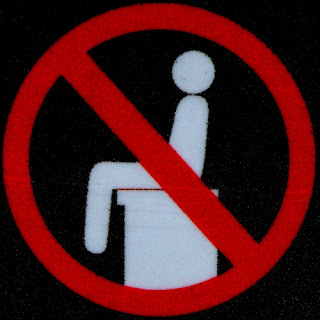 Do YOU have any suggestions for how we can band together to fit the perils of sitting?!? I suggest hiring a 3-year-old and placing many valuable items about. I have all of these things for rent, btw. Ye shall never sit again. You have a three year old and you still possess valuable movable items, Margaret? You must be really adept at not sitting. Or I suppose you could sit ON the three year old. Hmm, this does make things interesting in a work environment. 1. They haven't made a stand-up airplane that I know of, but I suppose I could do all my flight planning while standing, kneeling or lying on the floor. 2. No printer in my work environment, and everything I need to use legally has to be within reach with my seatbelt on. 3. I do that. I frightened one co-worker with my capacity. 4. Sadly, I often have to wait six hours for that. Fortunately, see #3. 5. I'm not allowed to use the telephone at work. 6. The doors on my workplace are mostly labelled "for emergency use only." 7. I do this between flights. 8. Slowly I'm doing this. But fortunately not due to a combination of #3 & #4. 9. & 10. As #7.
e. also, don't limit yourself to just one workstation. Switching back and forth between two or more chairs can provide a welcome break, especially if they are of different heights. Compulsive reading of blogs and e-mails is most helpful when NOT seated at the computer. Have you priced a standing desk??? The whole "let's take it outside" sounds like an invitation to fight ... which may lead to a real fight ... which may lead to a broken coccyx ... which will lead to no sitting at all (or very painful sitting) so I think that one is genius. Do as much work as you can on a smartphone. You, your crampy hands, and your poor eyesight will survive into your 80s. As someone working from home, I can also recommend eating five meals a day and cooking everything you eat from scratch. Putting the computer upstairs works for me. Do things like ironing and rotary-cutting, which canNOT be done while sitting IMHO. You gotta be standing. Set a timer and get up every hour. Amazing how quickly the beeper goes off! Talk to someone who has had a pulmonary embolism (and lived to tell about it) for an instructive motivational prompt.